This DSC starter kit combines all the best features of both a wired and wireless system and is perfect for installations where it's not practical to run wire to even a single keypad. 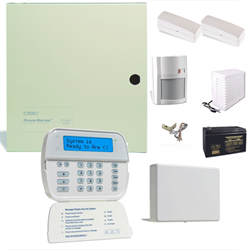 The main alarm panel has 6 on board wired zones and the kit includes a wireless transceiver that supports all DSC wireless sensors and even fully wireless keypads! With this kit the alarm panel can be installed out of harm's way and near phone and electrical wiring - usually in the basement or a wiring room/closet. It can accept either wired DSC keypads or additional WT5500 fully wireless keypads and includes one wireless keypad. NEW: Purchase an Envisalink EVL-4 internet module for smart phone control, email and SMS alerts with NO fees!